The Elevation Working Group is open to all and meets regularly to discuss statewide elevation needs. The group is currently developing a Statewide LiDAR Plan. Please contact us if you are interested in participating: geoinfo@mt.gov. The Montana State Library became the steward of MSDI Elevation in 2018. Efforts are underway to develop a Statewide LiDAR Plan and identify how to best leverage the USGS 3D Elevation Program (3DEP) initiative. MSDI Elevation Stewardship primarily involves leading the Elevation Working Group to elicit elevation needs and requirements and identifying partnership opportunties for acquiring LiDAR elevation data. GIS practitioners in Montana need to consider what spatial data, mapping, and modeling needs, requirements, and benefits could be met through higher-resolution elevation data, such as LiDAR-derived 1-meter Digital Surface Models and Digital Terrain (bare-earth) Models. Share your needs and uses of high-resolution elevation data with us by contacting: geoinfo@mt.gov. The 3DEP initiatives purpose is to repond to growing needs for high-quality topographic data and other three-dimensional representations of the nation’s natural and constructed features. The progam aims to obtain nationwide high-resolution elevation data coverage (primarily LiDAR) by 2022. With a Montana LiDAR Plan in hand, USGS 3DEP resources are available to assist with regional or statewide aquisitions of high-quality, enhanced elevation data. 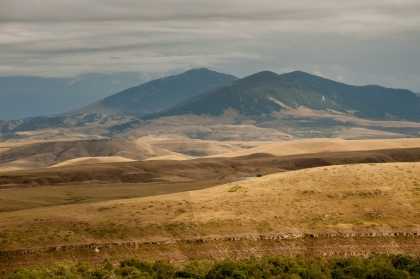 Visit 3DEP in Montana for information about higher-quality data collection in the state. SeaSketch - U.S. Federal Mapping Coordination - view priority areas for LiDAR acquisitions submitted by Federal and State agencies. Elevation data is a digital representation of spatially-referenced vertical positions above or below a datum surface. The data is most often used in grid (raster) form or via contour line data illustrating the elevation of the earth’s surface at defined intervals. Traditional Elevation Data is provided for use as products as well as source elevation data. Products include Digital Elevation Models (DEM), Digital Surface Models (DSM), Contours, and ancillary elevation products such as shaded relief maps. Source elevation data includes data like lidar point clouds (LPC) and ifsar radar returns. Shaded Relief elevation data for visualization purposes is one of the most widely used geospatial data themes in the world. Elevation data is also used to model water flow, mass movement of material (avalanches and landslides), line of sight analysis, and flight simulation rectification of aerial photography, gravity measurements, and terrain analysis. Lidar—(Light Detection and Ranging): airborne lidar is a remote sensing method that uses light in the form of a pulsed laser to measure ranges (variable distances) to the Earth. These light pulses—combined with other data recorded by the airborne system— generate precise, three-dimensional information about the shape of the Earth and its surface characteristics. IfSAR—(Interferometric Synthetic Aperture Radar): airborne ifsar is a remote sensing method using radar. This mapping method uses two or more synthetic aperture radar (SAR) images to generate maps of surface deformation or digital elevation, using differences in the phase of the waves returning to the aircraft.